Is uAutoDealers script absolutely open-source? Yes, this scripts is 100% open-source, You can use it for yourself or in your projects. You may change or customize it to suit your needs. Can uAutoDealers script be used on multiple sites/domains? Yes, but it depends on the edition you purchase: Standard allowes installation on 1 domain, Premium - on 5 domains and Professional - on unlimited domains. What are the minimum system requirements for this script? To install and run our scripts your web server must meet certain minimum requirements. Detailed information can be found on Requirements page. How do you distribute this script? All editions are distributed under ApPHP uAutoDealers License. What is the purpose of Copyright Removal License (CRL)? This license is written for one purpose and one purpose only: it grants you the right to remove our Copyright Information that is present on every single page of the script. This license is of secondary importance to our main license, that everyone receives when purchase uBusinessDirectory script or any additional modules, components of widgets for it. This Copyright Removal License means actually an electronic agreement between you and us. One copy of this agreement is kept on our server, and another copy could be kept in your site folder (recommended), as anti-violation proof. Each of our customers receives his unique identification key, which is not generated automatically, and because cannot be hacked. Can I use this script in commercial (not open-source) applications? Yes, it can be used in commercial and not open-source scripts. Why don't you sell your scripts and modules cheaper? We believe our prices for both uAutoDealers system and modules for well-made PHP open-source scripts are the lowest in the world for comparable quality. Some developers sell scripts they describe as a "one of the best system" for prices lower than ours - in some cases much lower. But such systems can range in quality of code from poor to dreadful, often being reqired monthly or yearly payments. We provide high-quality scripts, 100% open-source with One-Time payment. No hidden costs or recurring payments. Once purchasing our script you may use it without limitation for lifetime (according to our license), change or customize it according to yuor needs. We accept Credit Card, Debit Card or PayPal payments. 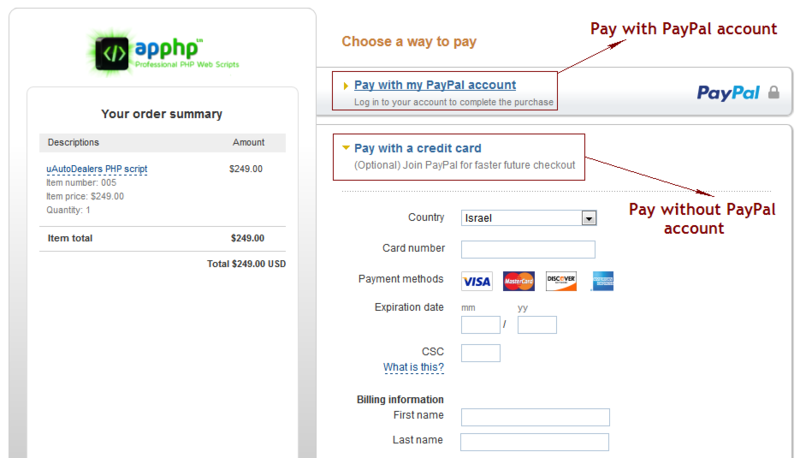 You may pay with your Credit Card or PayPal account (PayPal balance). Remember: No PayPal account is needed to purchases our scripts if you select Credit Card option (look here for detailed instructions). Is it a one time payment or do I have to purchase every year? The purchase of a script and/or modules is One-time for a Lifetime. A premium edition includes 1 year free updates, so you only need to prolong updates (if you need). Anyway, you may still use the script even without updates. You may check this script in our Live Demo version. We don't provide any trial versions, because the script is fully open-source. But... you may purchase a Standard edition and then if it meets your needs, you may upgrade it from Standard to Premium or Professional edition just by paying a difference in price. What customers really think about your products? These are some testimonials that have been sent in by our clients: Testimonials. Refund payments will be made using the same payment method you used to make the initial purchase. We cannot complete the refund if the original payment method is no longer available, for example your credit card expired, the PayPal account is closed, or where the payment method doesn’t allow a refund. Refunds are not available outside of the 30-day period. Do you provide additional payment solutions? To read more or order additional gateway payment solution CLICK HERE. Do you have additional "ready to use" modules for this script? We have more then 10 "ready to use" modules for this script, such as News, Polls, Gallery etc. Do you provide customization of your scripts? After you place an order, you will receive an email within few minutes. It will contain order number, payment information, your details and purchased scripts in archive. From this moment you could download and use this script. In some cases we reserve the right to change a download link with a mailing of CD/DVD disk to customer's post address (in this case mailing is free of cost). Post your message on the forum with example of your code or error description or write us. Post you message on the forum (recommended) or send us e-mail. You may also write us using Contact Us online form.